Southern California and Washington, D.C. campuses to hold ceremonies in the fall. 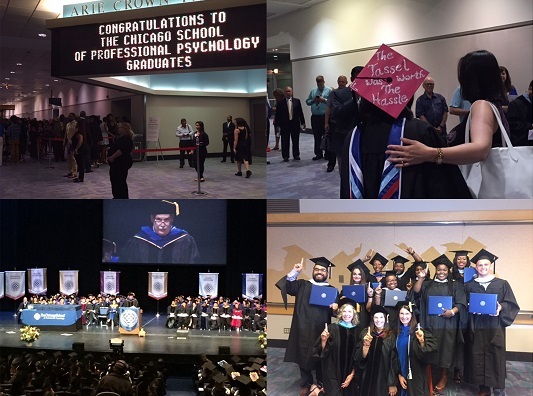 (CHICAGO) (JULY 10, 2017) More than 400 graduates from The Chicago School of Professional Psychology’s Chicago Campus and Online Campus reveled in excitement and pride at the July 7 Chicago Campus commencement ceremony. In all, The Chicago School awarded roughly 420 bachelors, masters and doctoral degrees in front of thousands of family members and friends at the ceremony. A nonprofit, private university devoted exclusively to psychology and behavioral health services, The Chicago School offers students more than 20 degree programs across four campuses. Ruby Lirio, a 2017 graduate of the Industrial/Organizational Psychology Program, also spoke during the ceremony. A fellow with TCSPP’s Center for Multicultural and Diversity Studies, Ruby has collaborated with other students to understand how the concepts of mental health and restorative justice can be applied in the workplace. Ms. Lirio is also a 2016 recipient of the Global Psychology Start-Up Fund for her proposal to increase mental health awareness in the Philippine workplace. The 2017 Distinguished Alumna is Laura E. Johnson, Psy.D., a 2008 graduate of the Psy.D. in Clinical Psychology Program and a Major in the U.S. Air Force. Currently stationed at Travis Air Force Base in Fairfield, California as officer in charge of the second largest mental health clinic in the Air Force, she will soon be relocating to the Kadena Air Force Base in Okinawa, Japan to serve as family advocacy officer overseeing family violence prevention and treatment. During her tenure at Travis, Major Johnson has also served as the Center for Deployment Psychology’s Prolonged Exposure consultant, president of the LGBT Alliance and founded Operation Combat PTSD, now Operation Invisible Wounds.